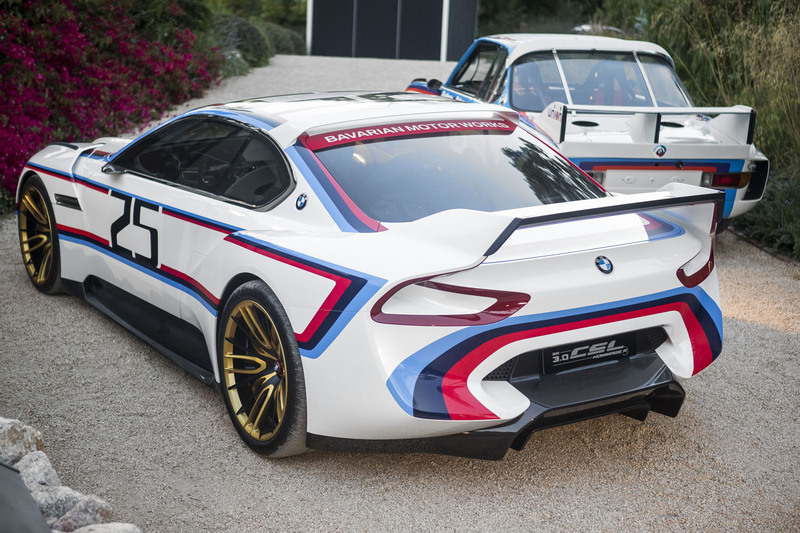 BMW 3.0 CSL Hommage R. The perfect fusion of driver and machine. 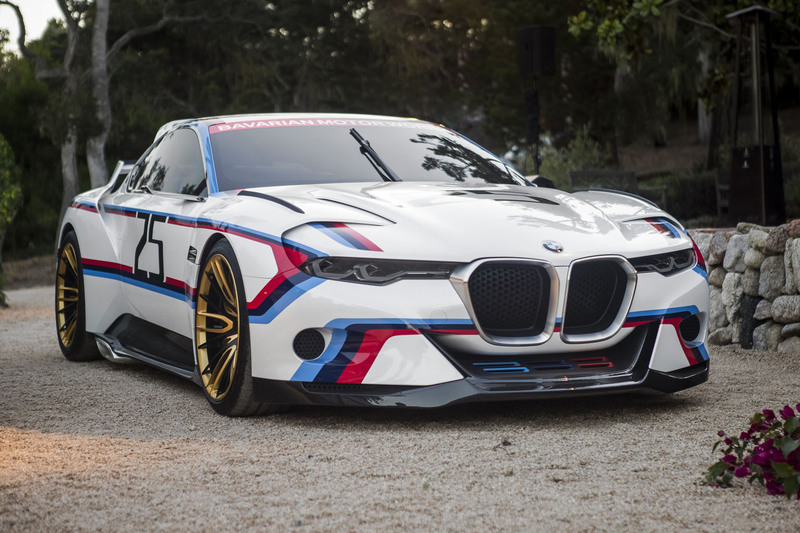 In August every year car enthusiasts from all over the world gather for the Concours d’Elegance in Pebble Beach to immerse themselves in the fascination of both automotive treasures from years gone by and pioneering studies for times to come. 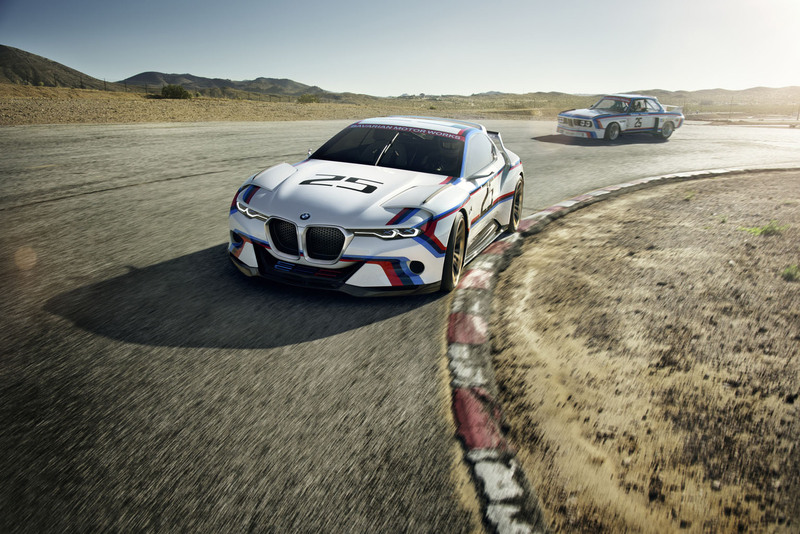 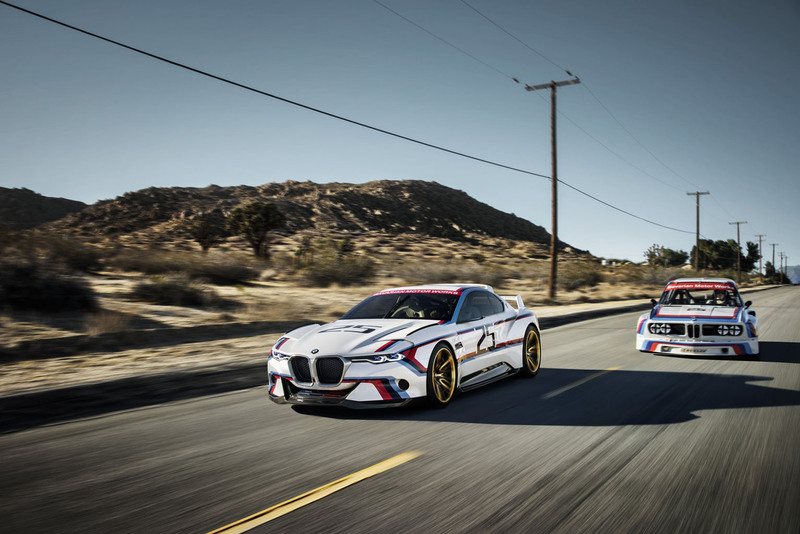 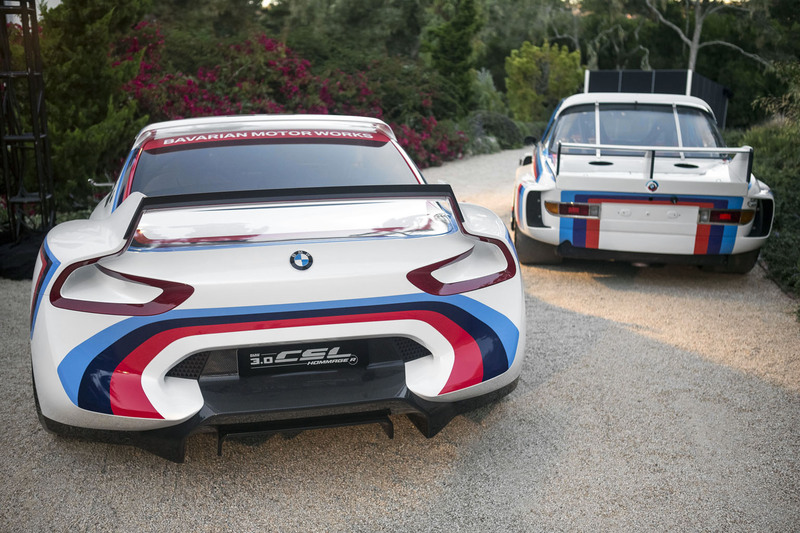 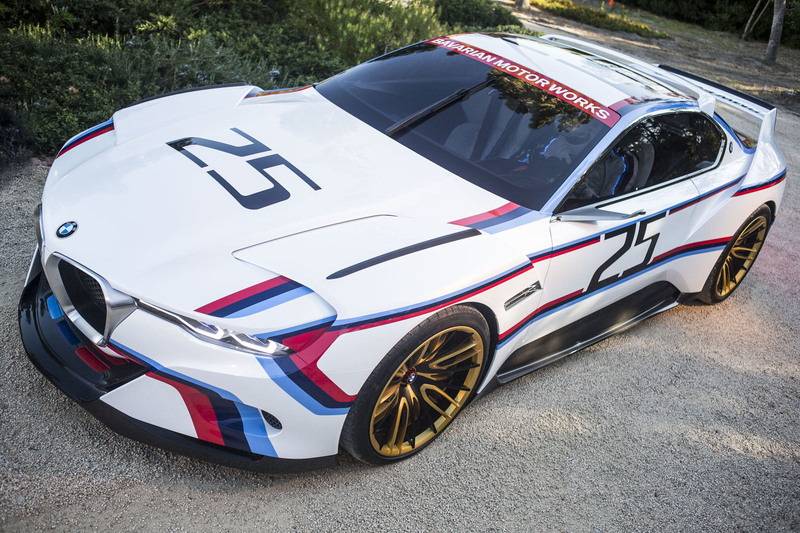 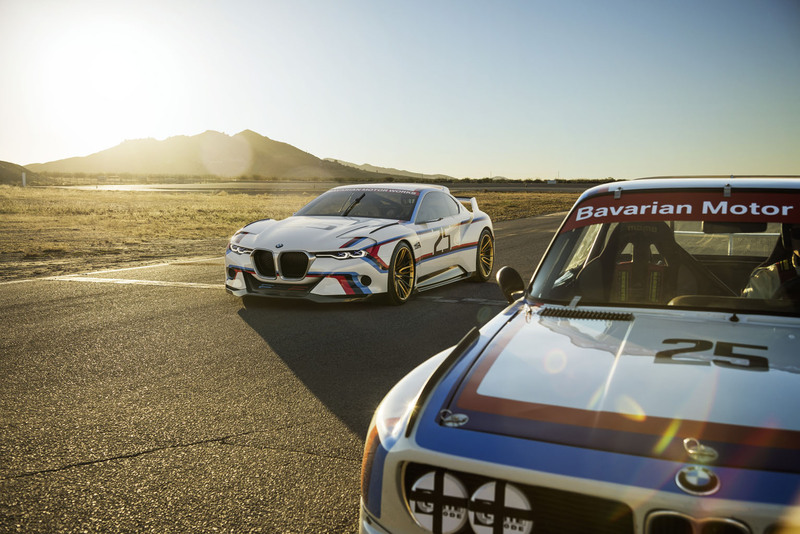 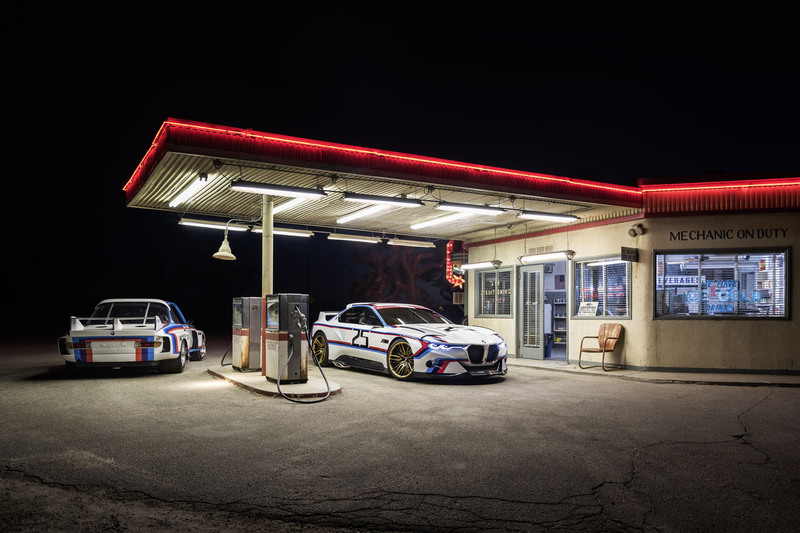 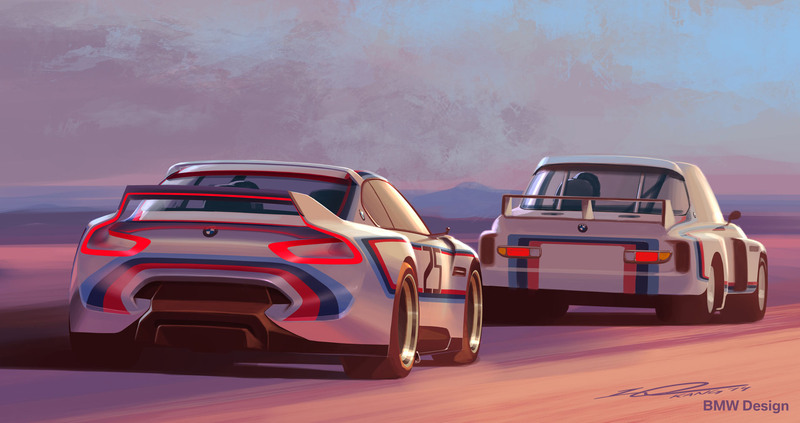 The BMW Group has come up with something very special this year with the world premiere of the BMW 3.0 CSL Hommage R – a car that celebrates both the 40th anniversary of BMW in North America and the heady racing success of the BMW 3.0 CSL in 1975. 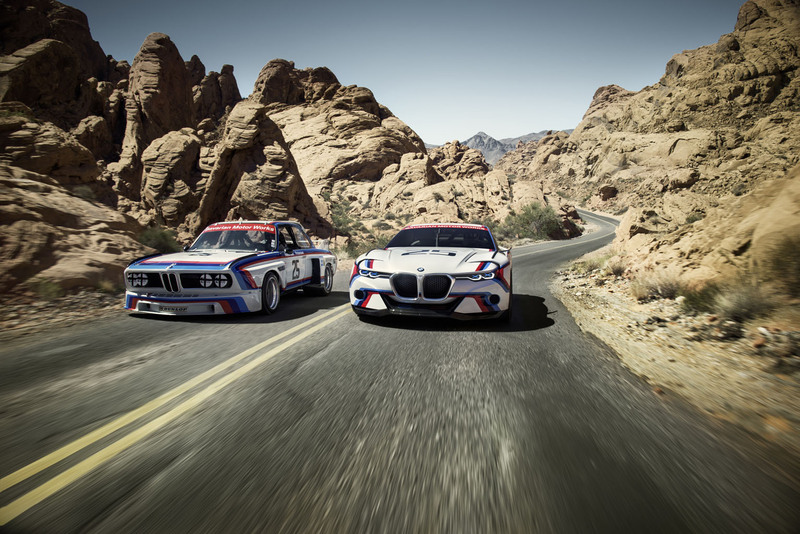 1975 was the year the Bavarian manufacturer founded BMW of North America, its first official sales company outside Europe. 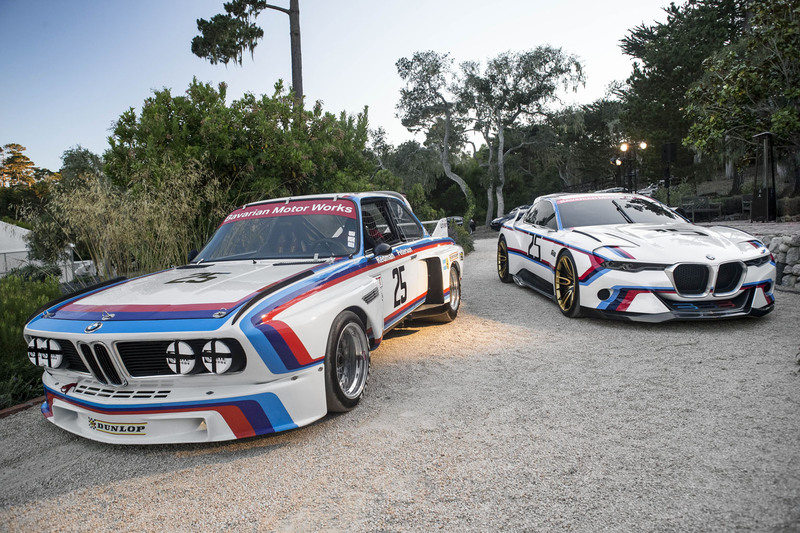 It was also the year in which BMW Motorsport made its debut in motor racing stateside – in the IMSA series – with a specially made BMW 3.0 CSL. 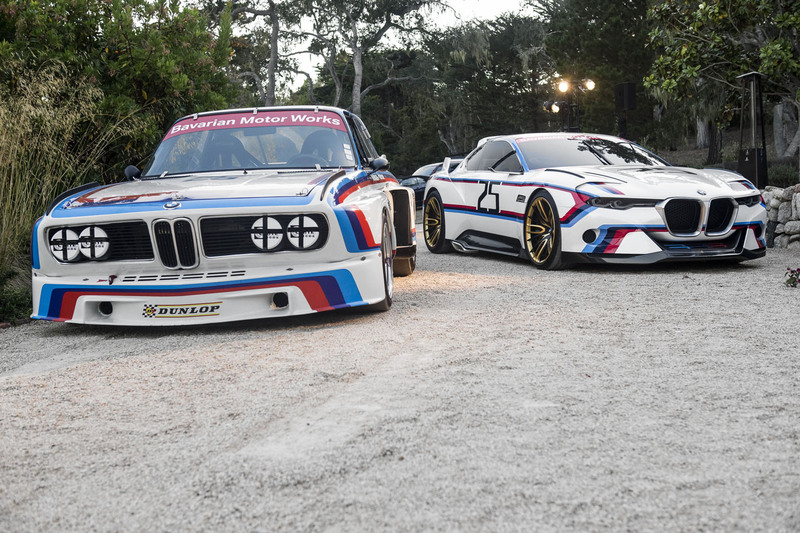 Just a few weeks later BMW recorded its first, historic triumph at the 12 Hours of Sebring. 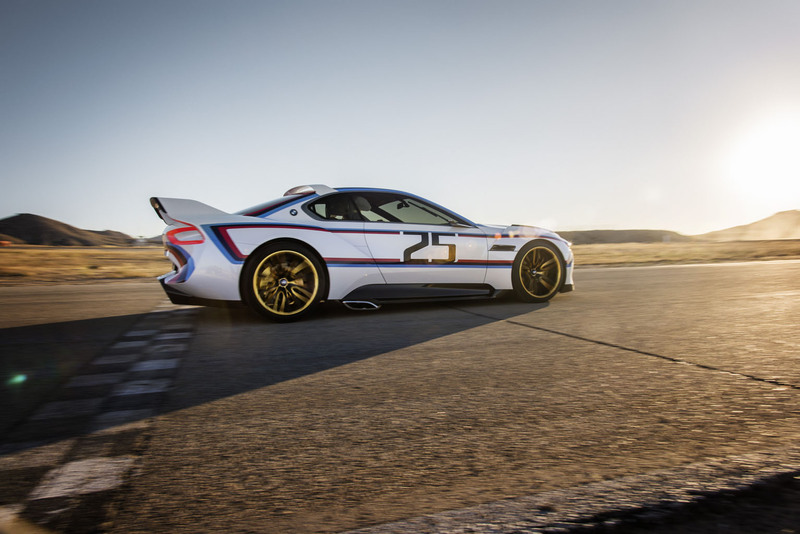 This was followed by a succession of victories, including one at Laguna Seca, just 15 miles from Pebble Beach. 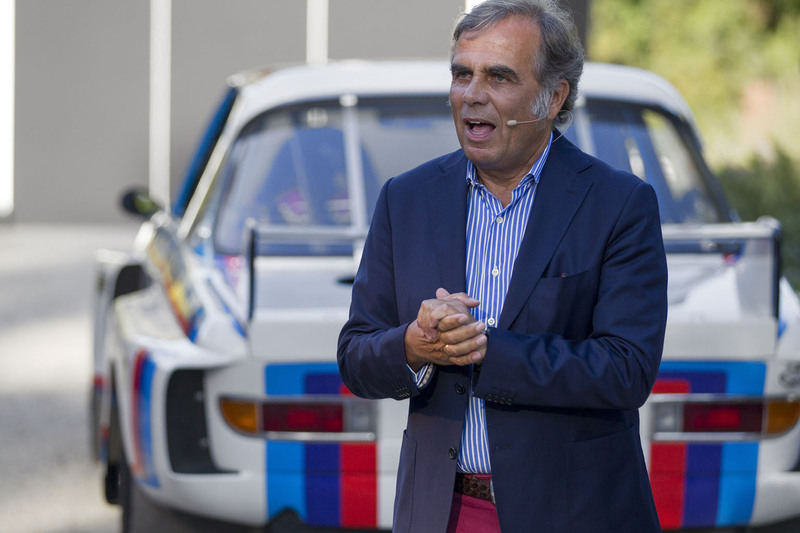 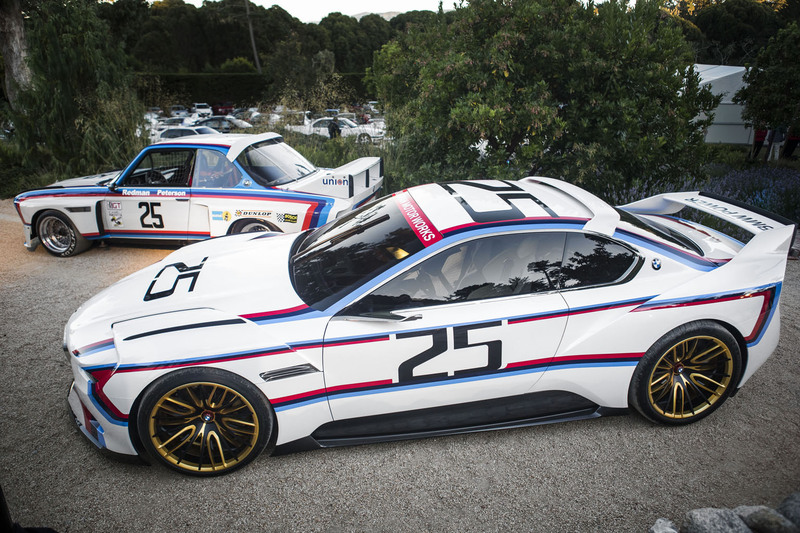 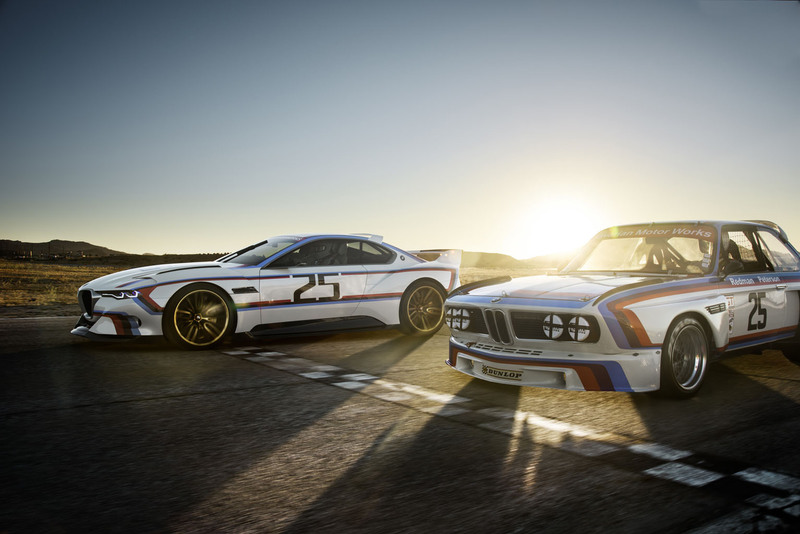 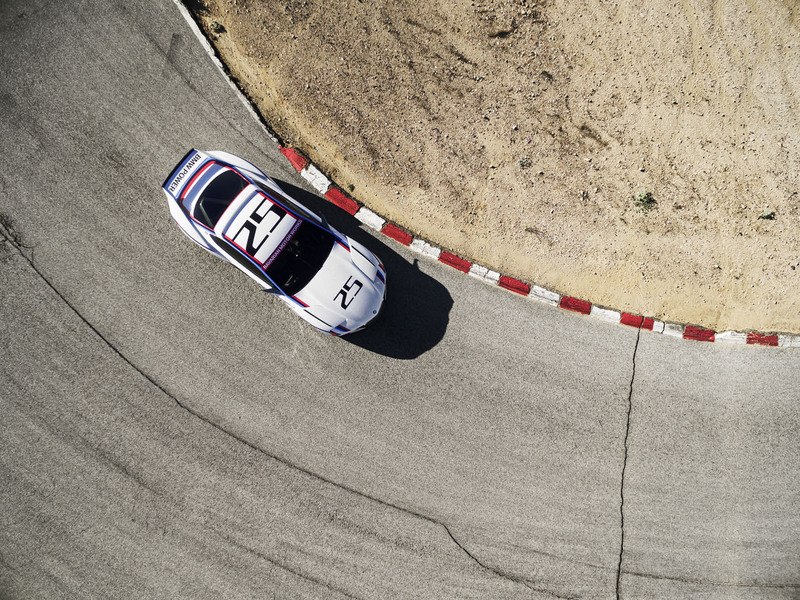 BMW’s rookie year duly culminated in the white BMW 3.0 CSL, decked out in eye-catching BMW Motorsport livery, winning the manufacturers’ championship at the first attempt. 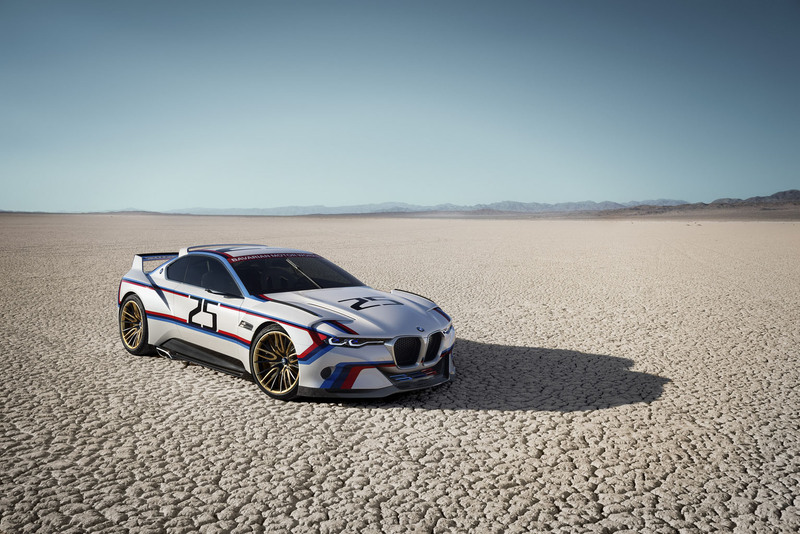 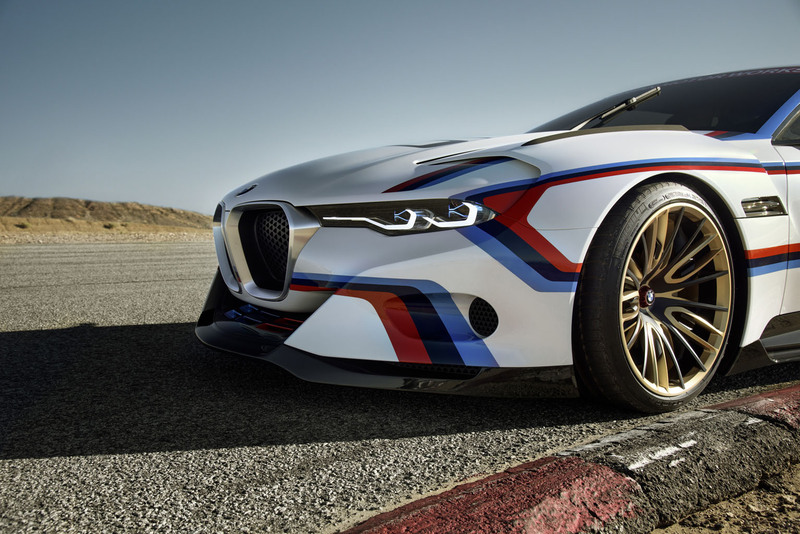 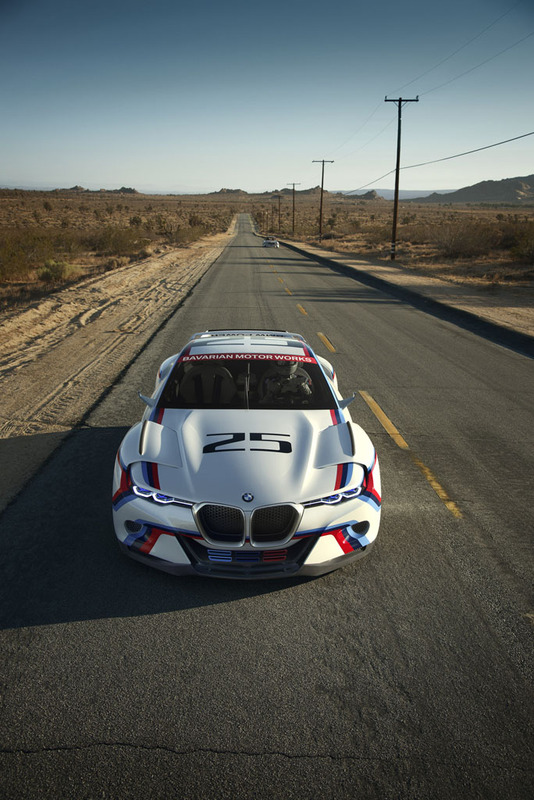 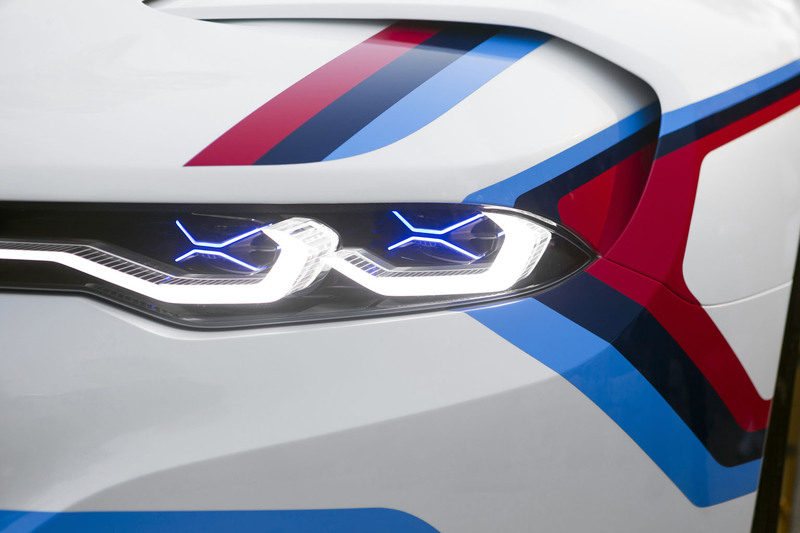 This success, coupled with the car’s striking design and the “Bavarian Motor Works” legend emblazoned across the sun protection film on the windscreen and rear window, announced the BMW brand’s arrival in racing-mad North America with a bang. 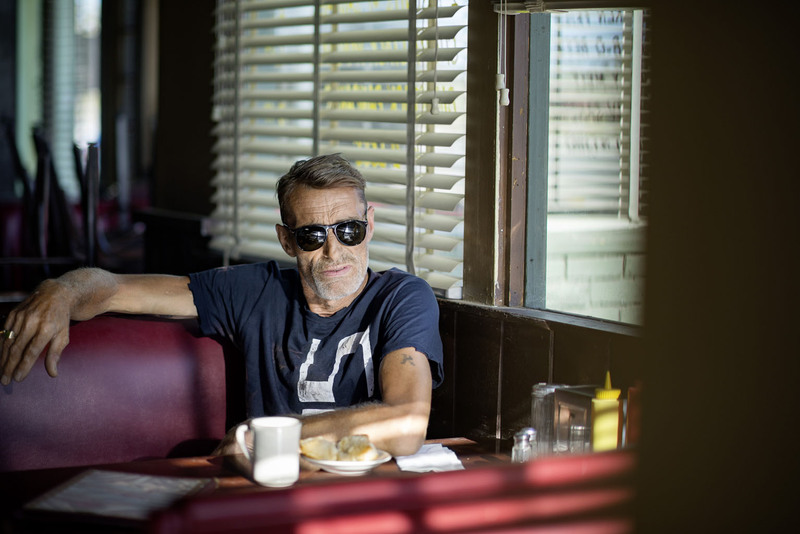 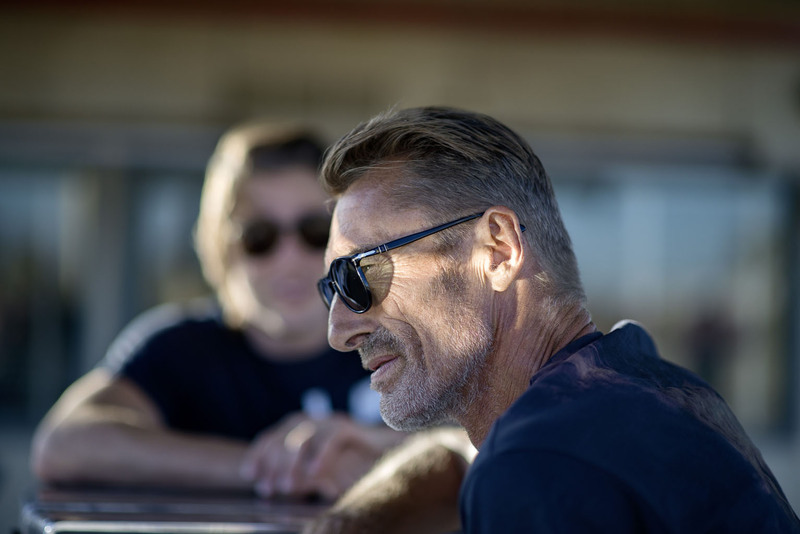 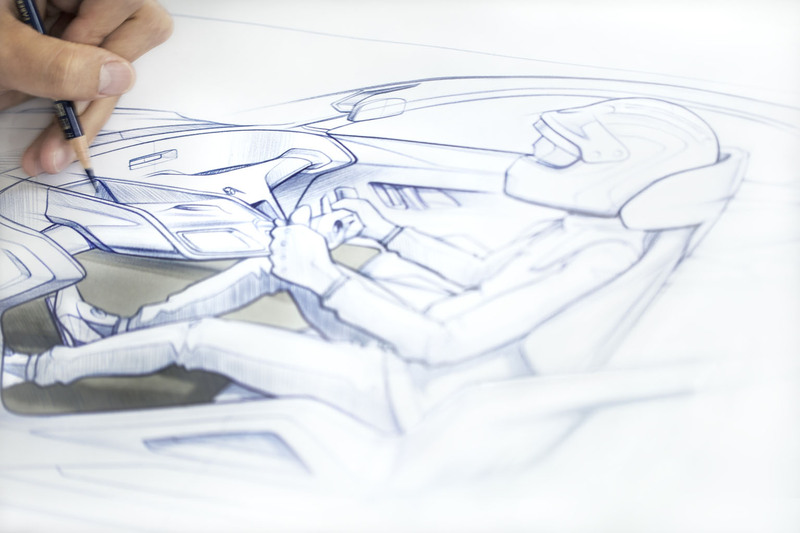 A new level of driver focus – the interior. 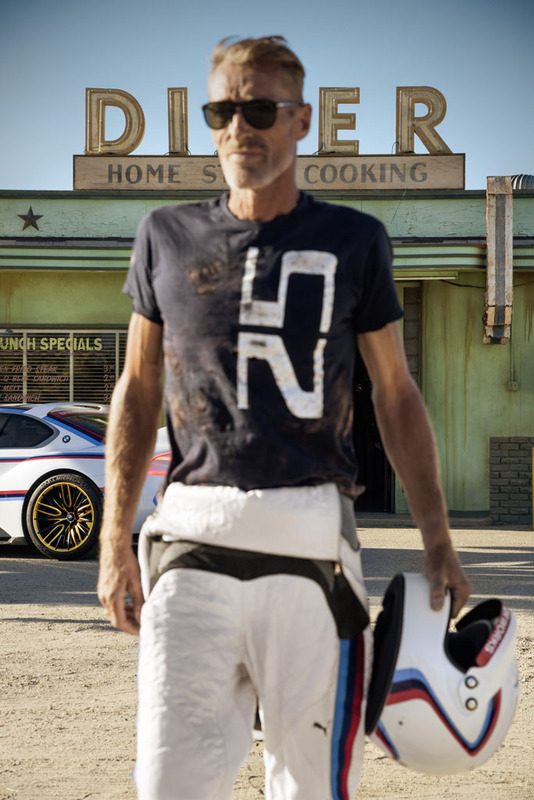 As well as helping him to do his job, the driver’s race suit (a classical design by Puma®) visually expresses the connection between the driver and the car. 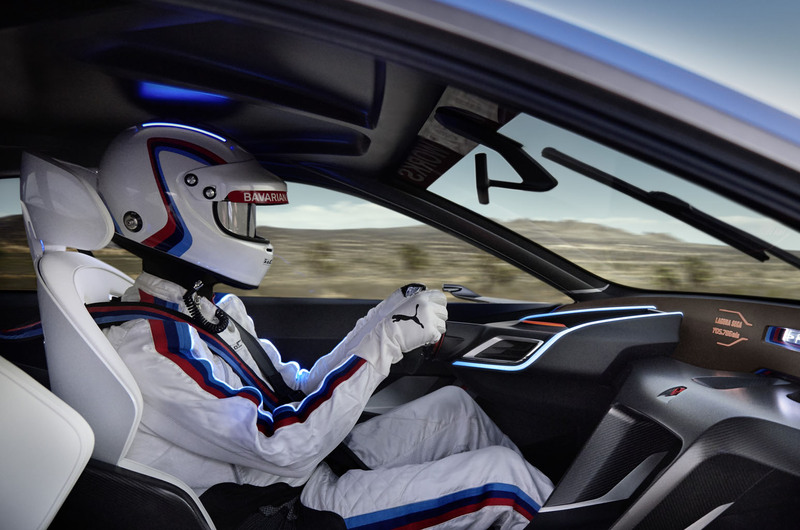 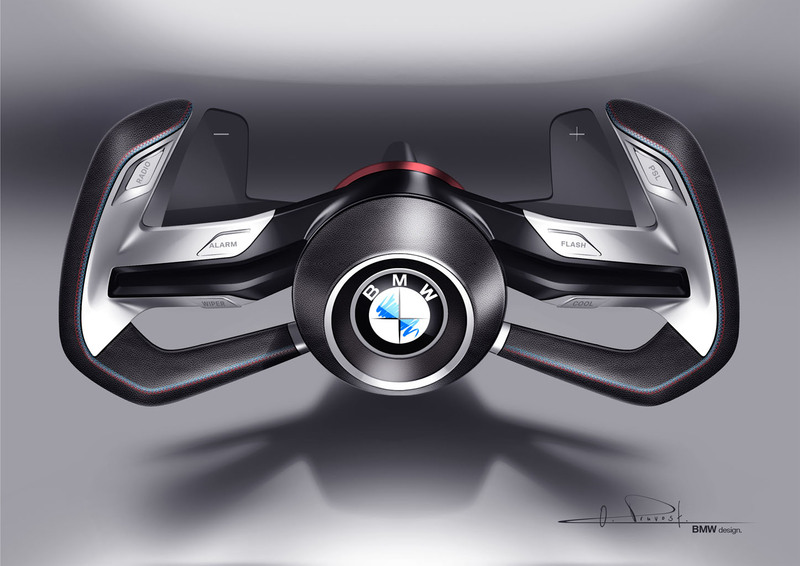 If both the driver’s hands are on the steering wheel, illuminated piping integrated into the sleeves of the suit shows the progress of information – from the shift impulse display, for example – out of the steering column over the driver’s arms and into his visor. 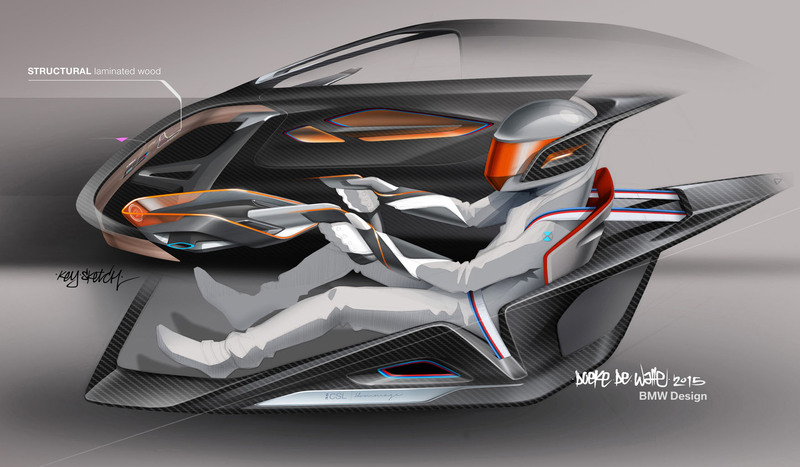 The side-section design of the large carbon-fibre seat shells reflects the anatomy of the seated driver, thus providing maximum support in any driving situation. 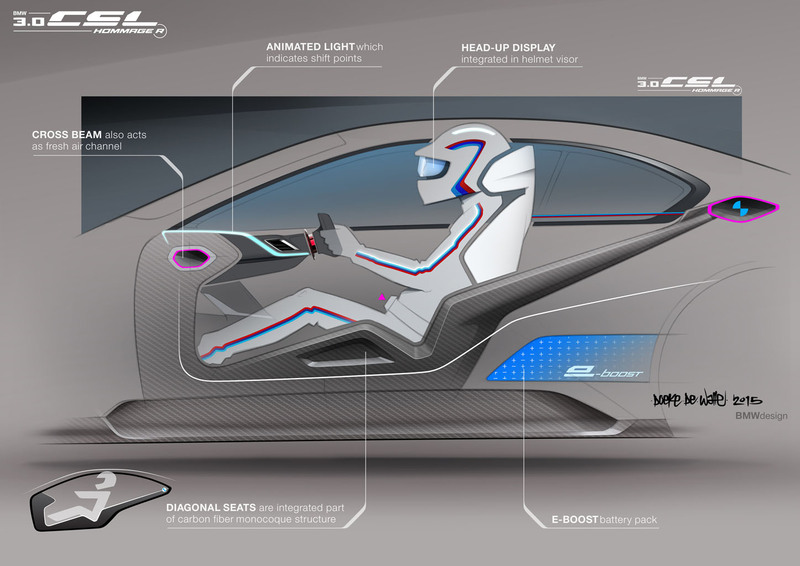 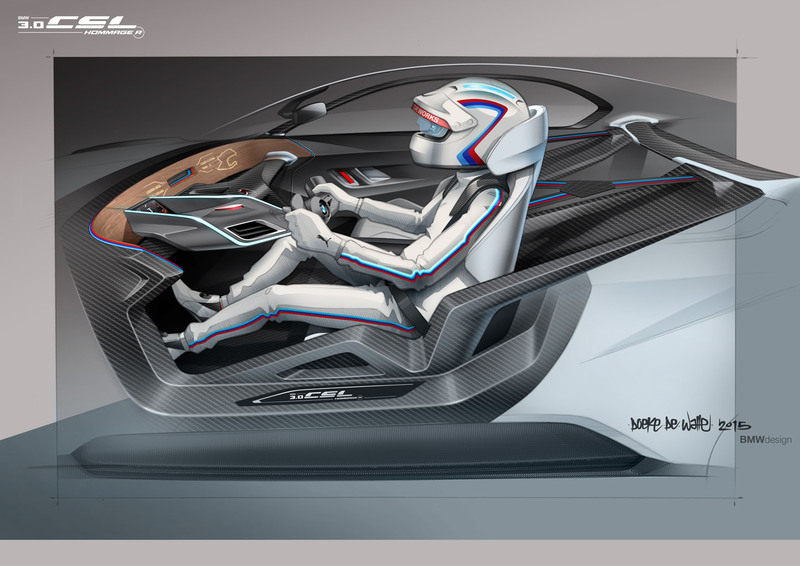 At the same time, the seats ensure the driver’s body has the best possible connection with the car, giving him a physical feel for it with almost his whole body, in any situation, and thus allowing him to react faster and more effectively. 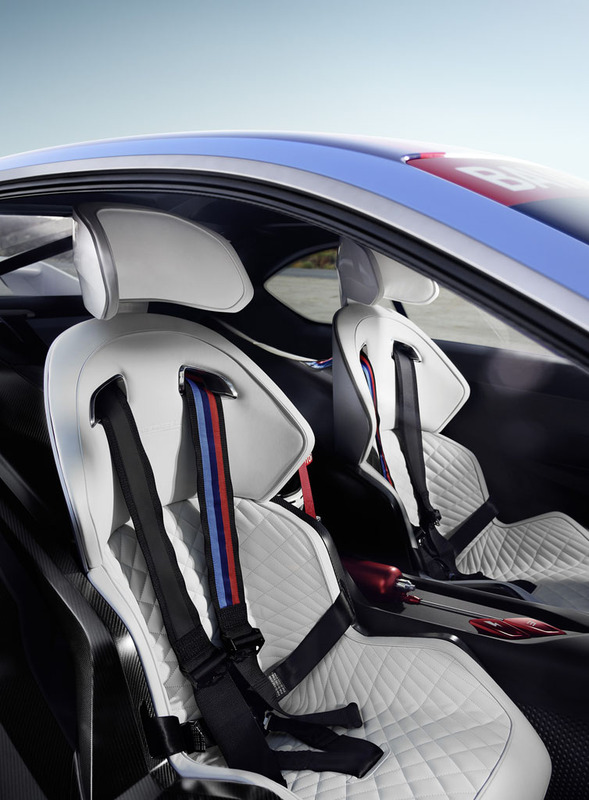 The seat shells follow a rising diagonal path rearwards, a line extended behind the seats into the rear by a structural carbon-fibre element that increases the torsional rigidity of the BMW 3.0 CSL Hommage R. The white seat surfaces with fanned-out quilting, integrated into the seat shell, mimic the design of the driver’s race suit, while BMW Motorsport’s signature stripes on the six-point safety harness add an extra splash of colour. 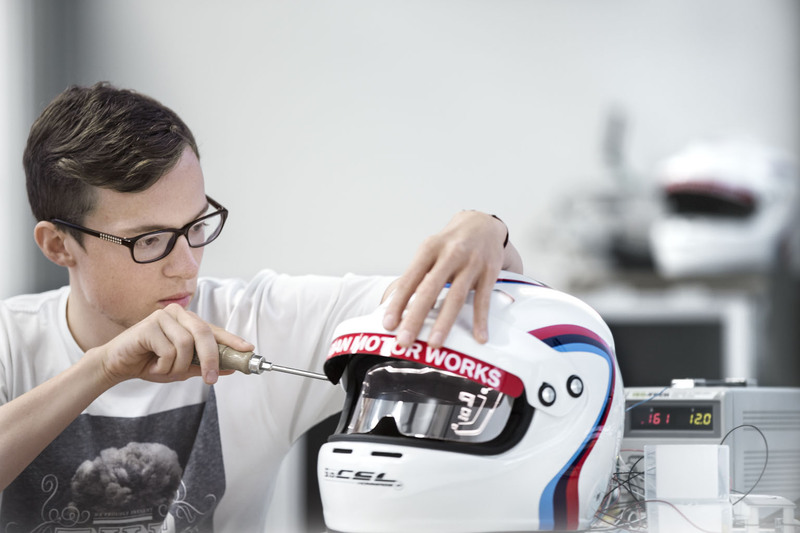 Commitment to lightweight construction and technical refinement. 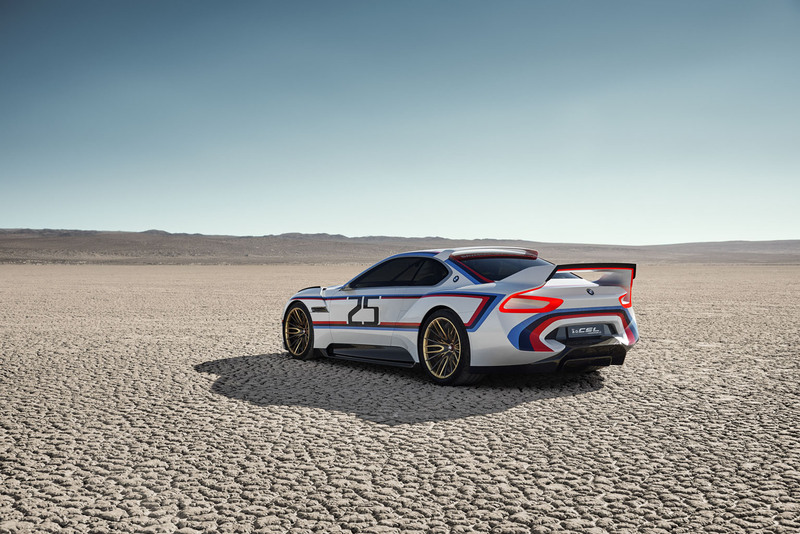 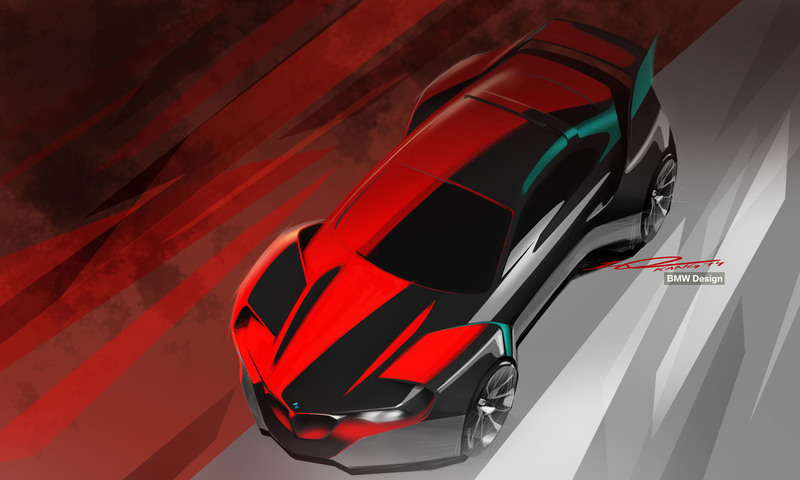 In the area around the driver’s seat, the designers have drawn back the covers on the lightweight design of the BMW 3.0 CSL Hommage R and lent tangible form to its racing character. 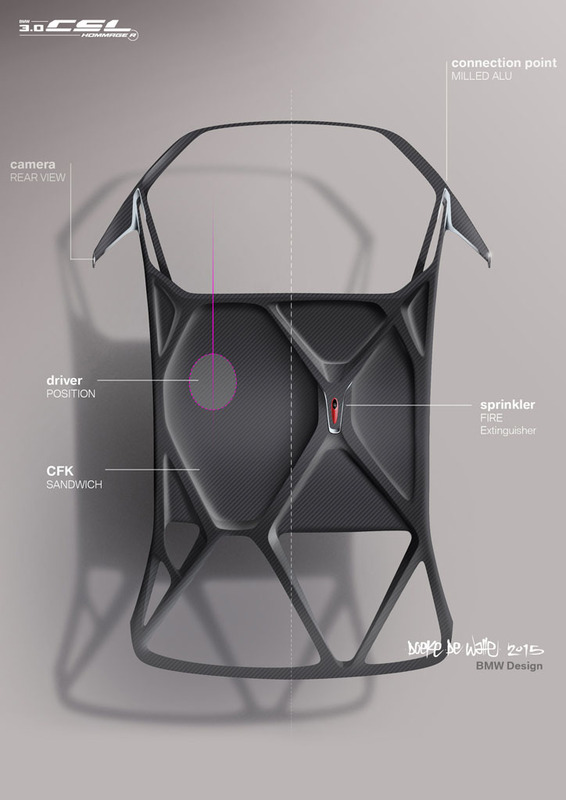 A carbon-fibre roll cage integrated into the structure of the car’s roof and side sections forms the basis for the interior’s singularly minimalist geometry. 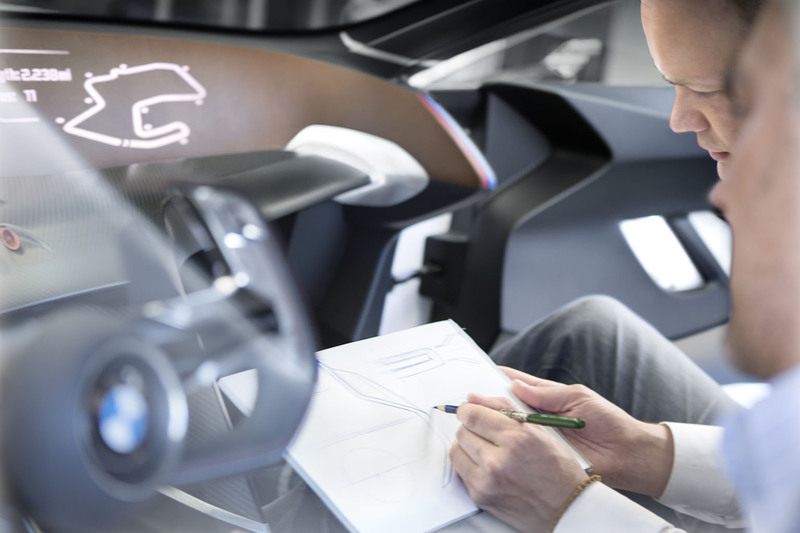 All the elements in the interior are there out of absolute necessity; every component has been designed with a purpose, a function linked directly to the structure of the machine or the job of driving. 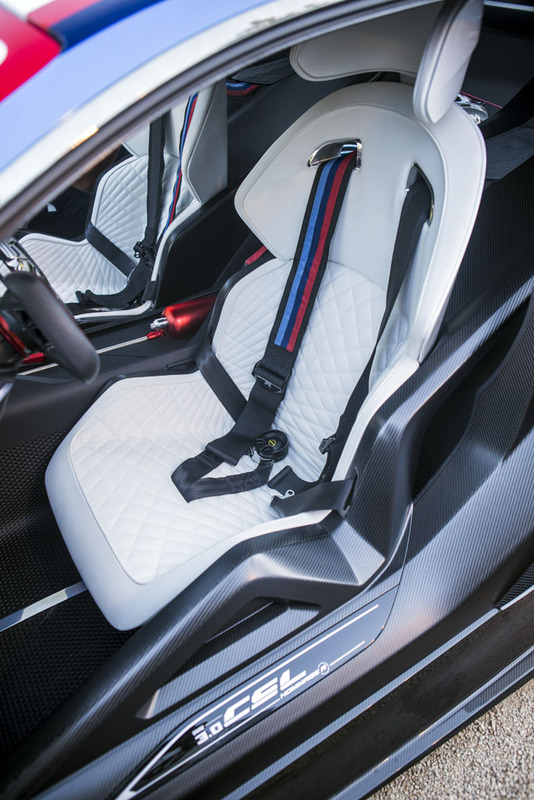 In an interior made almost entirely from carbon fibre, the only wood-like presence is the “instrument panel” – actually a cross-member and purely structural element. 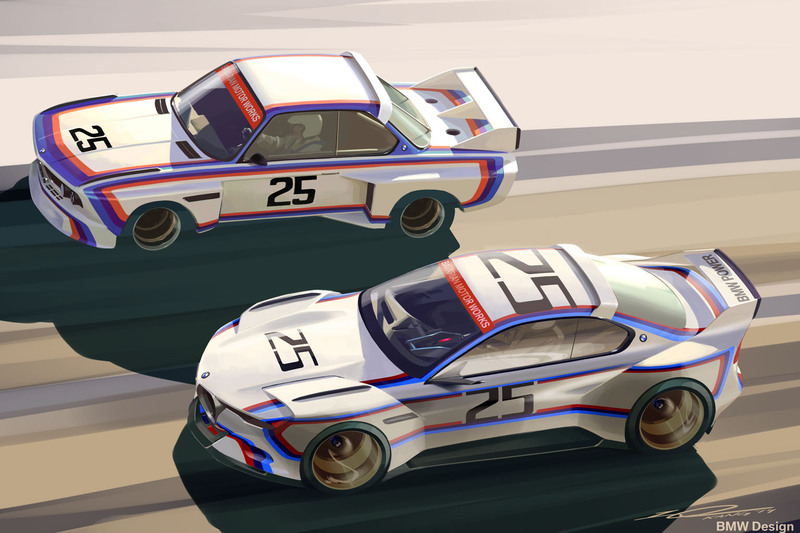 This is a reference to a central element of the earlier BMW 3.0 CSL, in which even the racing version had distinctive wood trim ringing the whole of the interior. 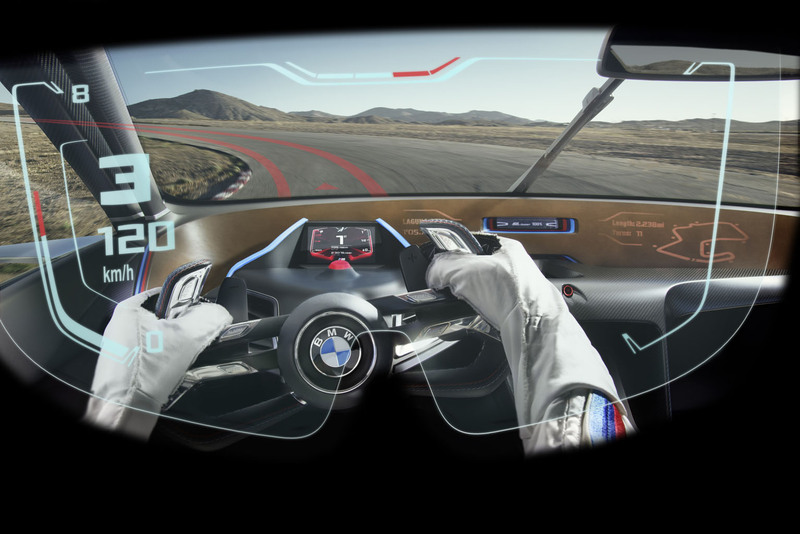 A particular highlight here is the additional information illuminated through the wood. 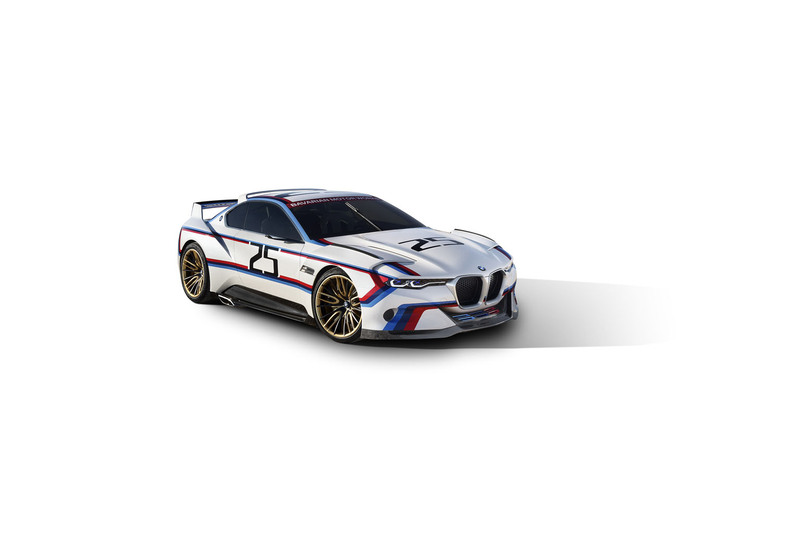 Recalling the BMW 3.0 CSL’s victory at Laguna Seca in May 1975, the BMW 3.0 CSL Hommage R displays the track layout and braking points through the instrument panel’s wood strip. 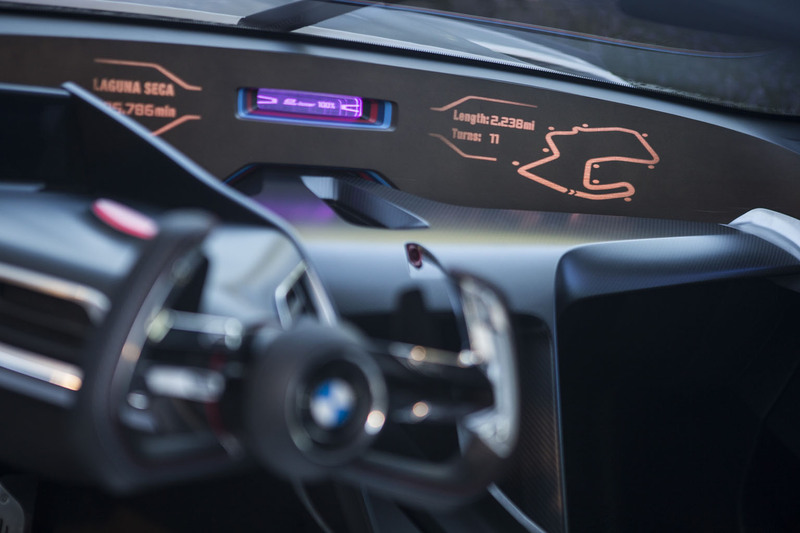 By using light in this way, this ultra-sophisticated, super-smooth information display removes the need for a classical display and slips perfectly into the car’s minimalist interior design philosophy. 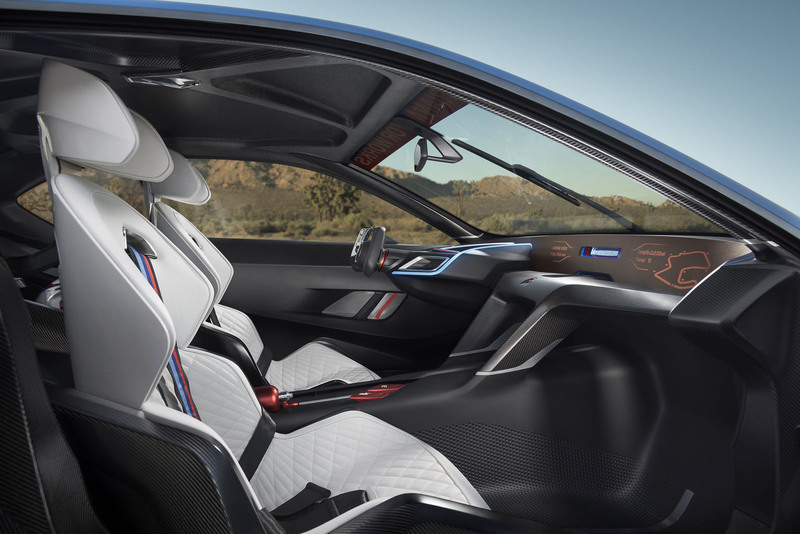 Only the small central eBoost charging display interrupts the flow of the otherwise unbroken wooden surface. 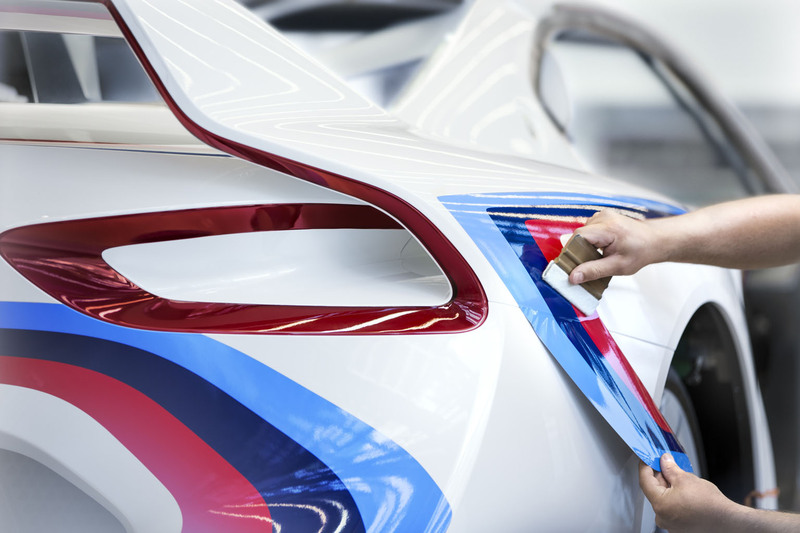 BMW Motorsport stripes for the instrument panel surround lend extra colour. 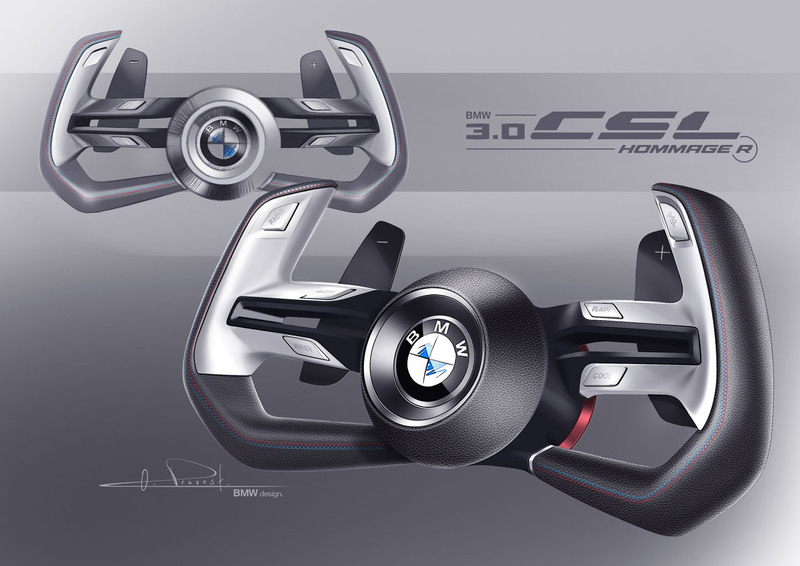 The commitment to paring the car down to the bare essentials places particular emphasis on the steering column. 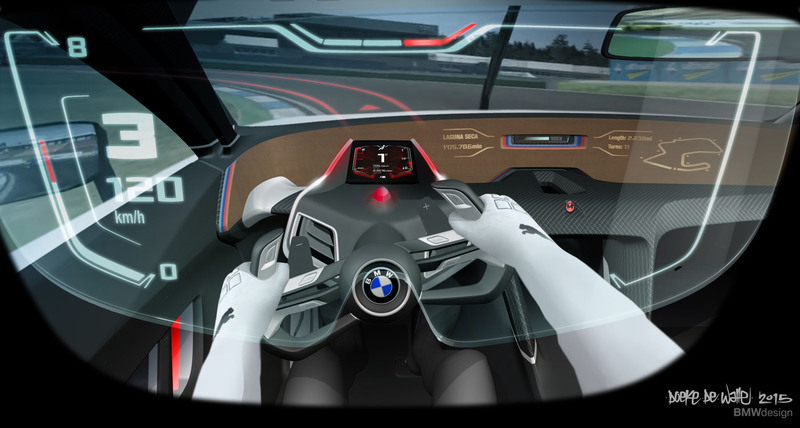 As a mechanical link between the driver and car, it is home to all the operating elements and controls. 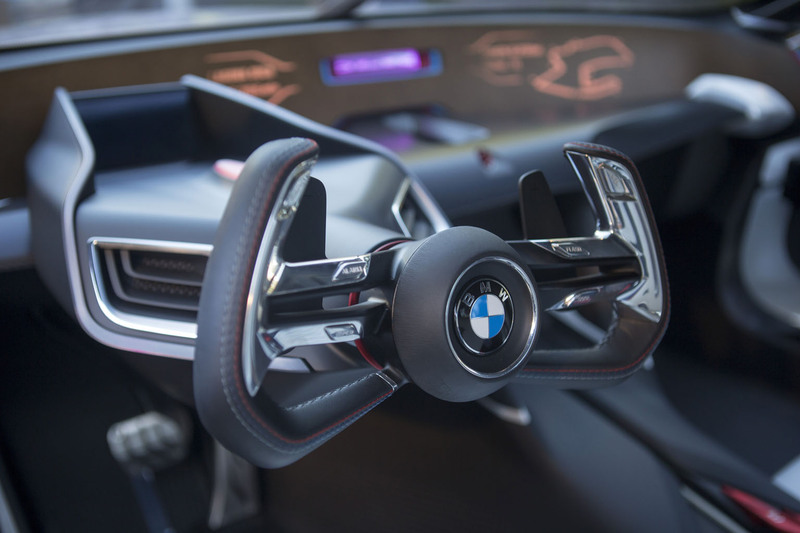 The only “comfort” function are the two vents on the sides of the steering column, which supply the driver with fresh air at ambient temperature. 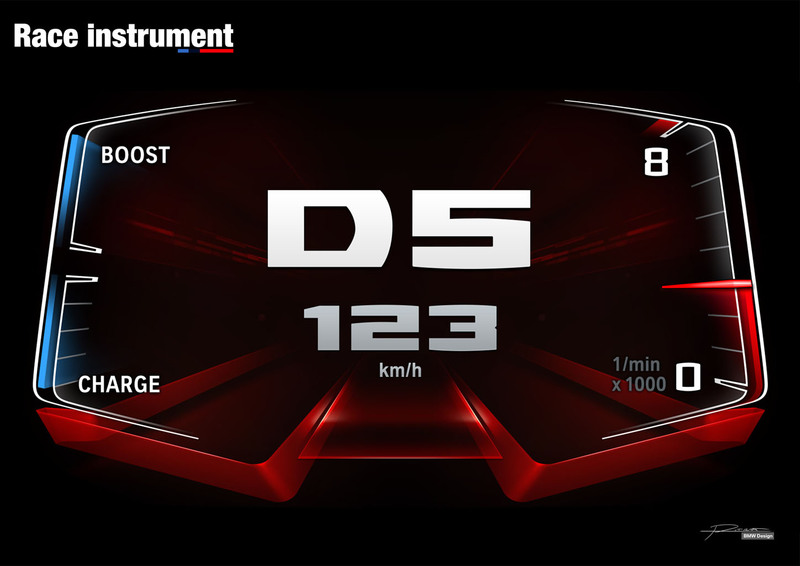 A small display on the steering column provides the driver with secondary information such as lap times, overall race time and the car’s current track position, as required. 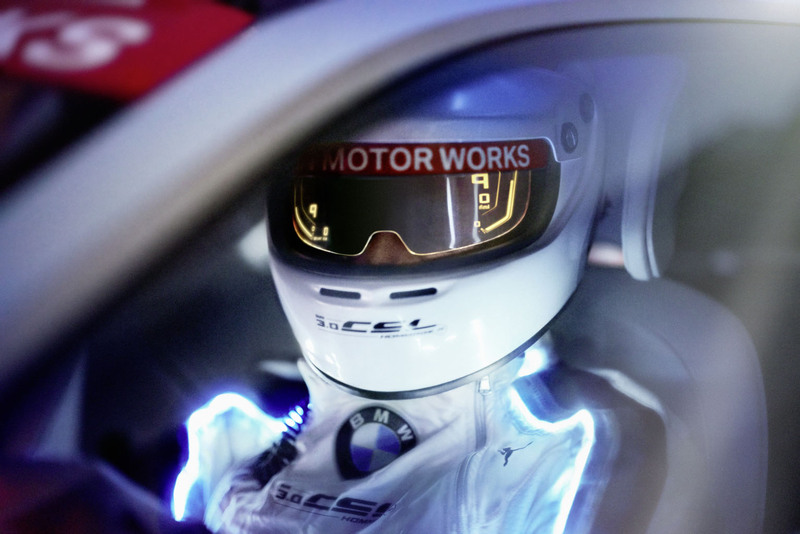 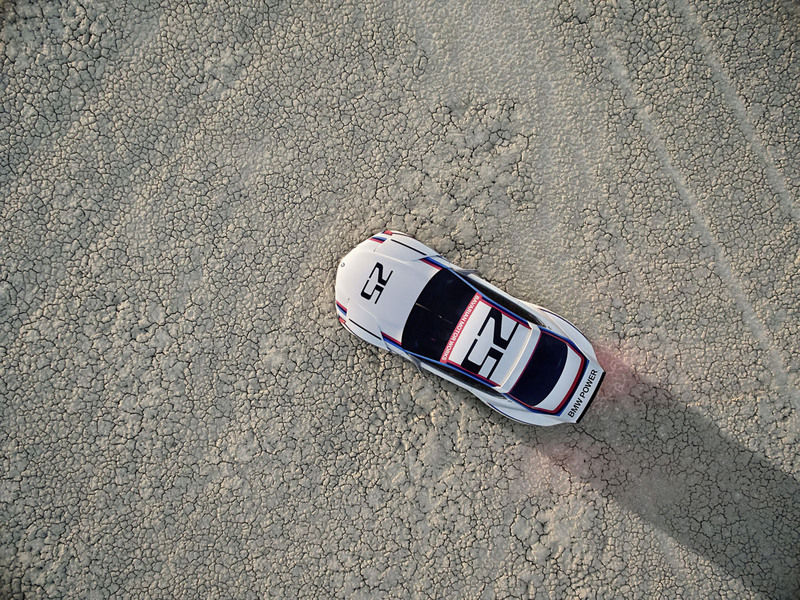 Other racing elements in the interior include red anodised safety features, such as the outlet nozzles for the fire extinguishing foam, the extinguisher itself, and the two switches on the centre console for the emergency shut-off and fire extinguishing mechanism. 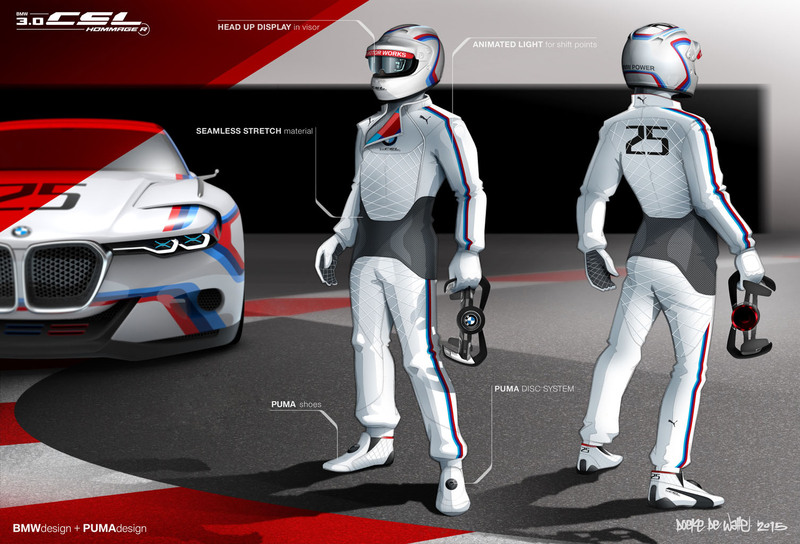 The rear only has space for two helmets integrated into the centre tunnel. 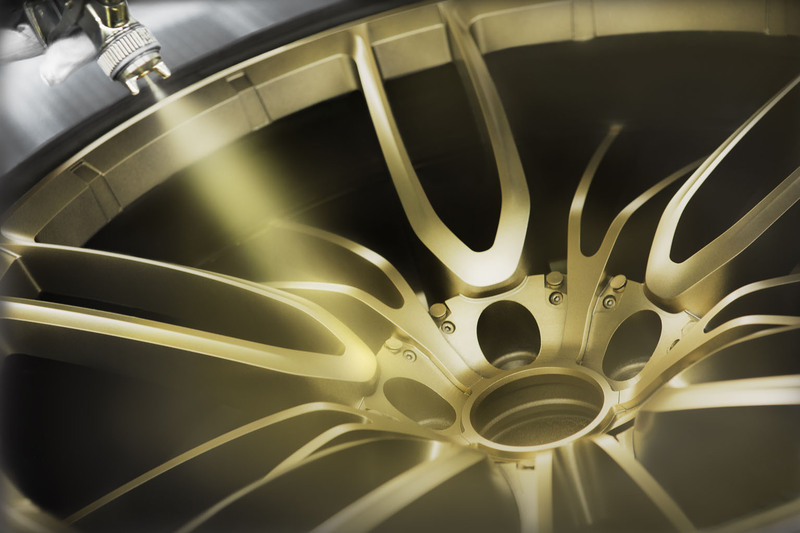 These are held in place by a belt when not in use. 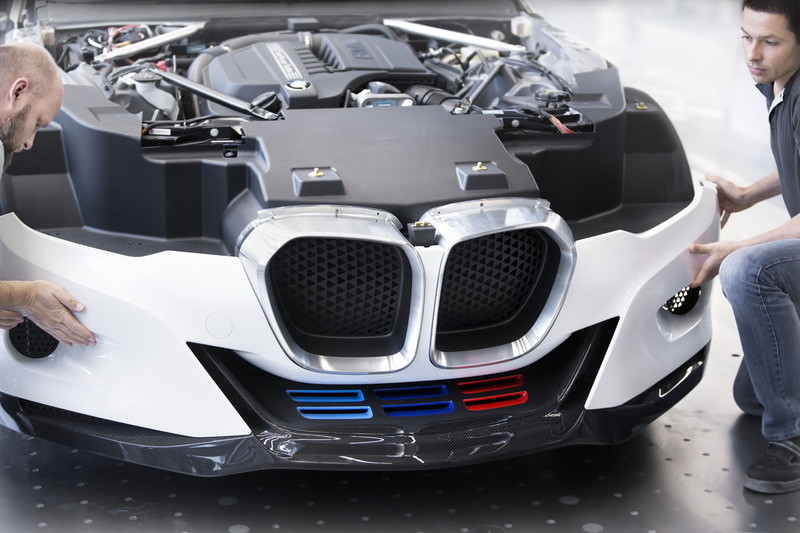 Underneath the longitudinal braces jutting out to the rear are the covers for the eBoost energy accumulators. 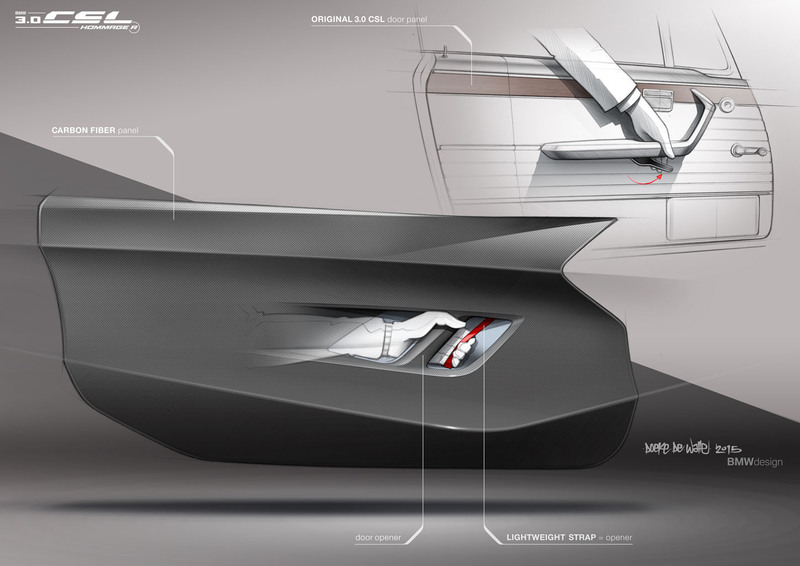 Meticulously crafted aluminium sleeves add high-quality accents at the junctions between individual structural elements. 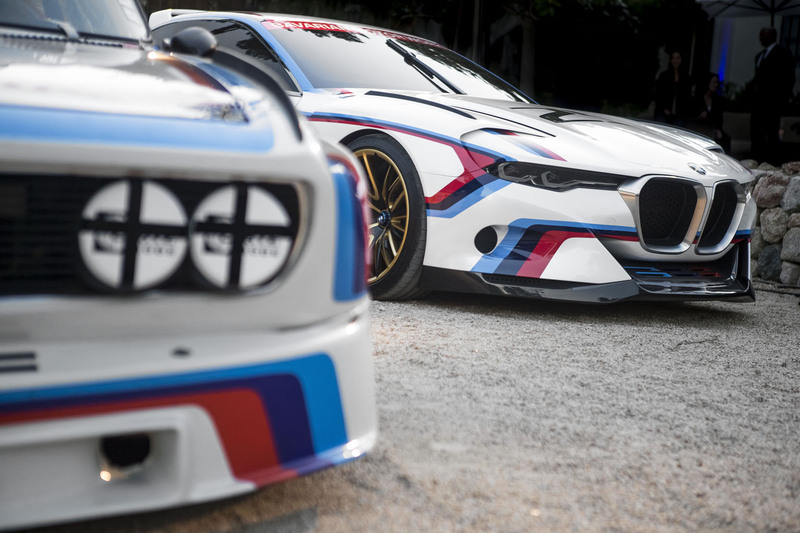 In its materials and detailed solutions, the BMW 3.0 CSL Hommage displays both technical sophistication and subtlety of form. 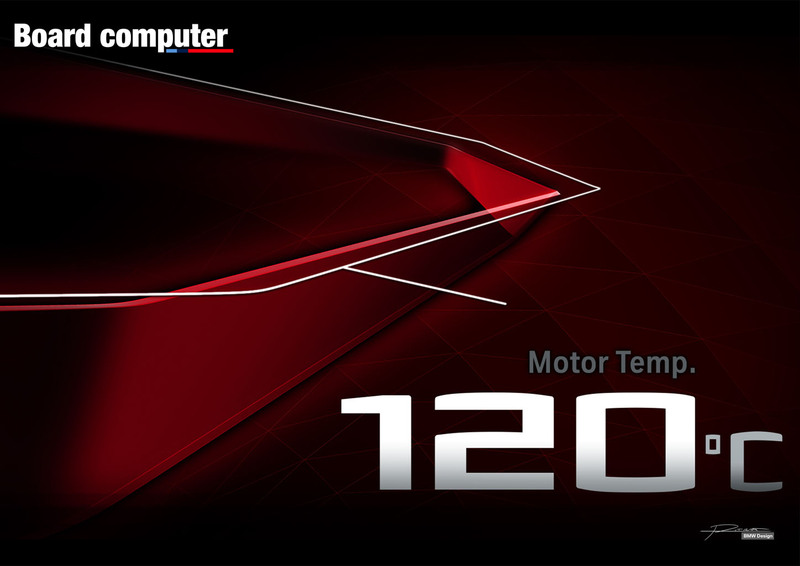 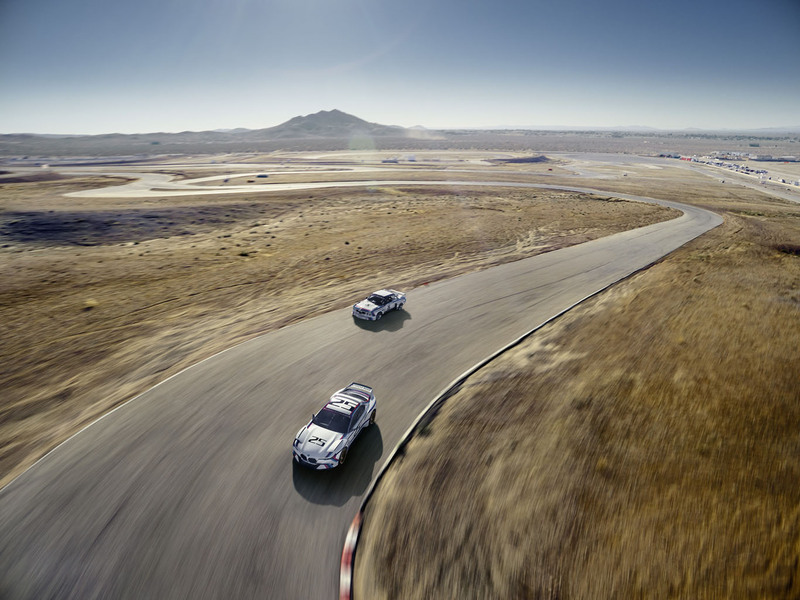 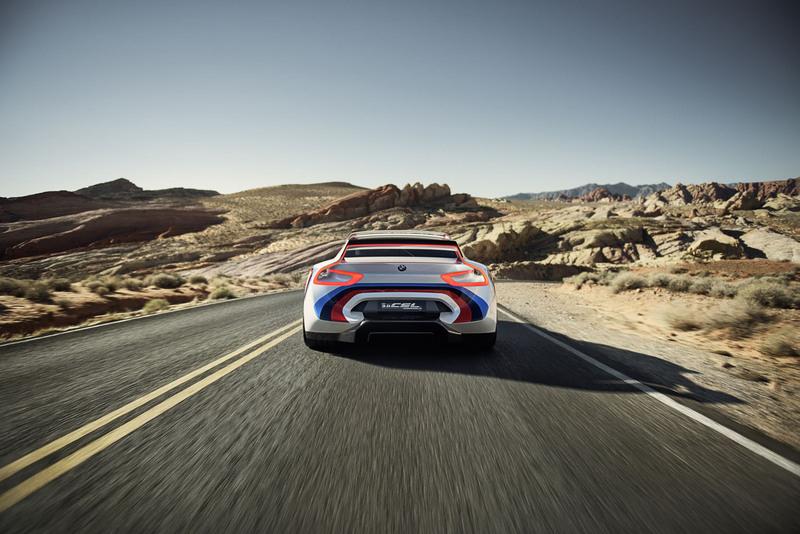 Motor racing through and through – the exterior. 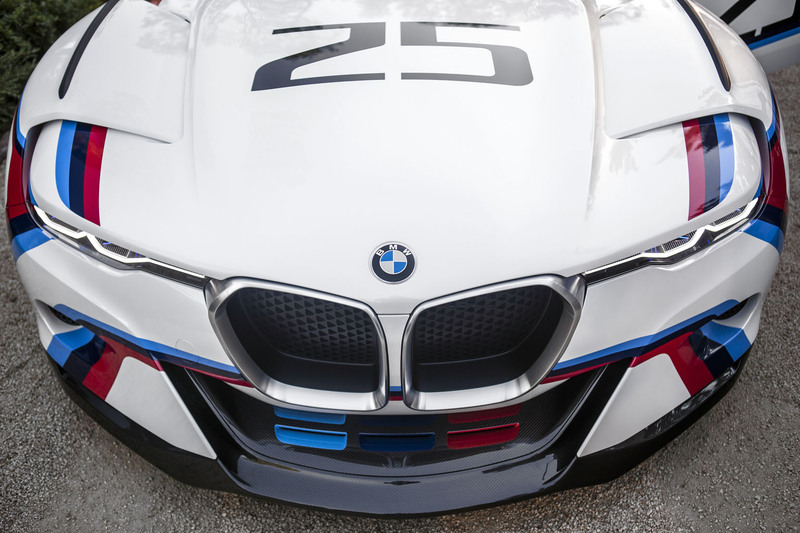 Power and athleticism – the front end. 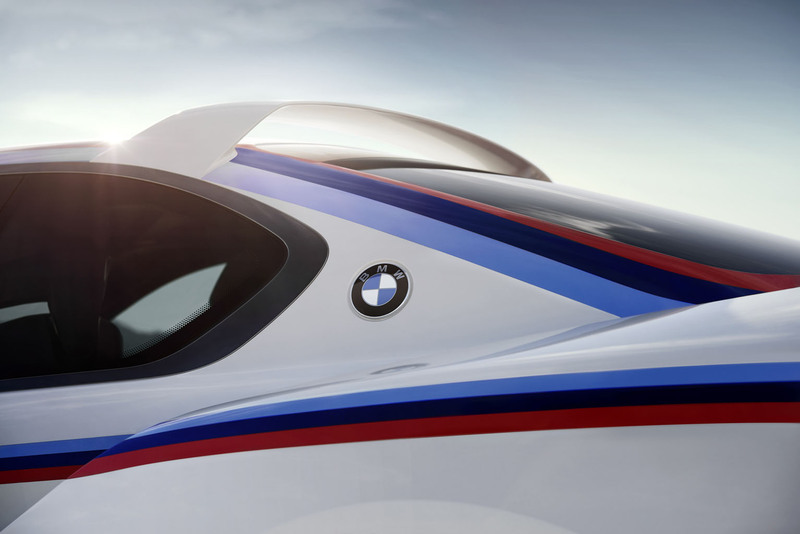 From the side – sporting flair with a touch of elegance. 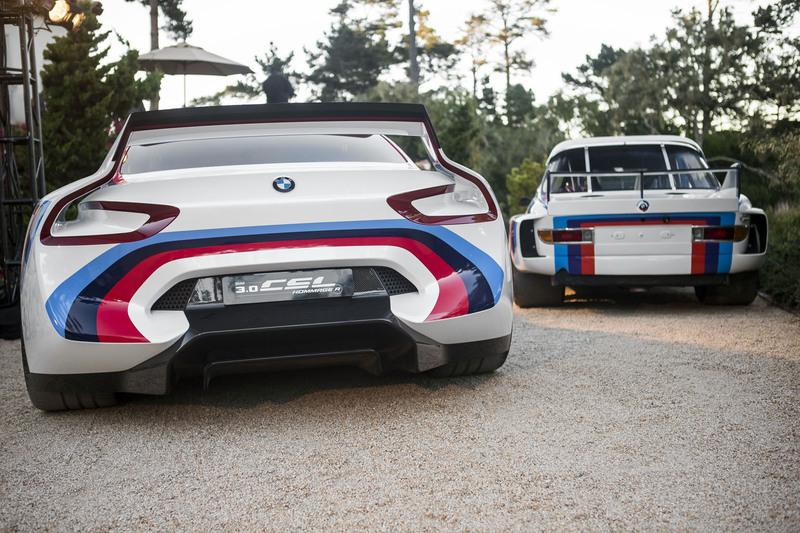 The rear end – muscular presence.